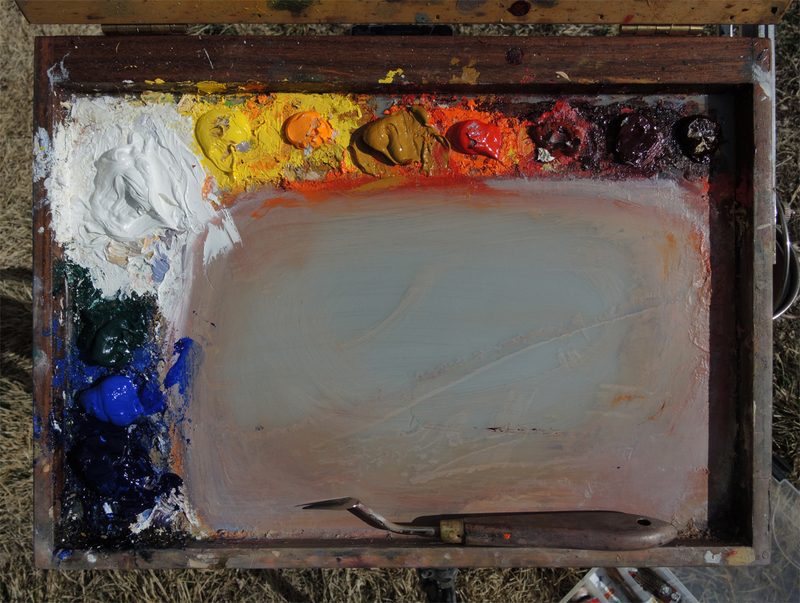 On April 10th, I will be lecturing on the outdoor palette at the 2nd Annual Plein Air Convention & Expo. And speaking of the convention... If you are going to be there and want to hear my talk you should pre-register for it asap. Don't wait. I have been told the room is filling up and may max out. 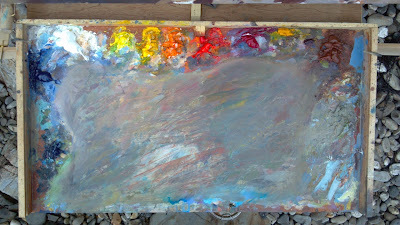 I will talk about these palettes, what they can do in the field, and I will also demo how to mix with them. Plus there will be a Q & A session so you can follow up with specific questions. My lecture will be at 9:30 am on the first day. After completing this survey I was surprised to discover how similar everyone's palette was, and how similar we used them. 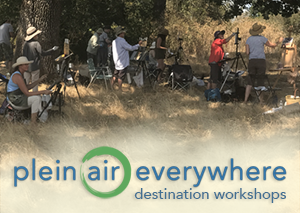 Surprised because I chose well-known plein air painters from all over the country – even reaching out to Europe to Marc Dalessio – artists who have different looks to their paintings. (Links to their websites have been provided below.) From the extended conversations we had on the phone it was clear everyone relies on the warm and cool theory of color mixing. With few exceptions (Jill Carver, Jean LeGassick, and myself), the artists I spoke to tended to put more colors on their palette when in the studio. Perhaps it is because they have more time to deliberate indoors or maybe it has something to do with working at a larger scale. In any case, when a painter first goes outside he or she quickly learns their subject is in a constant state of flux. There is no time to mess around and every fifteen minutes it becomes a new painting. (Frustrating, isn't it?) At most, we have a window of a few hours to create a masterpiece, and because of that the best outdoor work tends to embrace expediency. So perhaps that is why all the artist converged on a similar set of hues. Because in capable and experienced hands, the mixing of intense warm and cool primaries can convincingly express the effects of temperature and light. Side Bar: The Limited Palette It should be noted many plein air painters purposely work with a reduced palette; which means two or three hues plus a white, and the results can be spectacular. The paintings of Kevin McPherson and Lori Putnam come to mind, with many more artists worthy of mention. But there are physical limits to what subtractive mixing can encompass and such limits make it impossible to represent the entire spectrum of light. So if any readers out there prefer a limited palette out of choice or virtue, I salute you. I paint with a reduced palette too now and then, like when I went to Spain and Morocco last October. It helped to lighten the load. And also, back in the mid-90s, I painted four years with only Alizarin Crimson, Cadmium Yellow Light, Ultramarine Blue, and Titanium White. So I appreciate the appeal of a limited palette. If anything may be generalized about the contemporary outdoor palette, it is likely to contain both warm and cool versions of the primaries and secondaries. 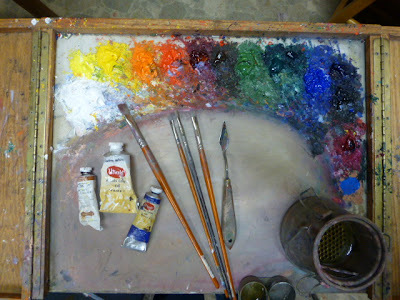 Which makes it similar to the palettes used by a lot of 19th century Impressionists. With exceptions, of course. Today, modern synthetics such as Indian Yellow, Transparent Oxide Red, and the super saturated Pthalos – which can become the crack-cocaine of the plein air enthusiast – often usurp their 19th century counterparts. But the idea of mixing with warm and cool primaries still holds. The findings of my informal survey are offered below. The information is only accurate as of March, 2013. 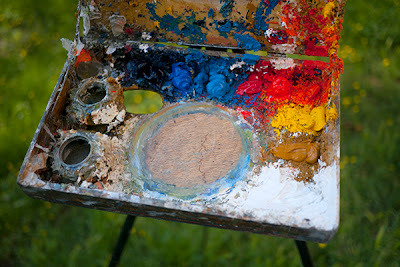 The palettes you see here may change over time because few painters hold to the same set of color over a lifetime. And finally, thank you to all the artists who participated! Any mistakes or misrepresentations found in this post are mine and mine only. Caused by my misunderstanding or bad typing while on the phone. Egregious errors will be corrected, if requested. Mix on a neutral gray palette, about 10 - 20 percent gray. Establish shadow pattern immediately and work from dark to light as much as possible. Recommends lining up 20 paintings to see if a single color appears too often. If so, take the color off the palette for a while. The palette I started with included Naples Yellow, an earth red (Pozzuoli, English…etc), and Veridian. I have also used high chroma oranges and purples for specific projects with orange trees, irises and such. Use a little Pthalo green mixed with Alizarin to create a cool gray for tin roofs. But avoid using Pthalo in a green mix. First try to use the innate value of your hues before mixing white into them. Consider the effect of a color's opacity or transparency when mixing. Uses Open Box M side shelf to increase her mixing area (visible in the photo above). Quarantines her whites and lighter values on the side palette to keep them clean. 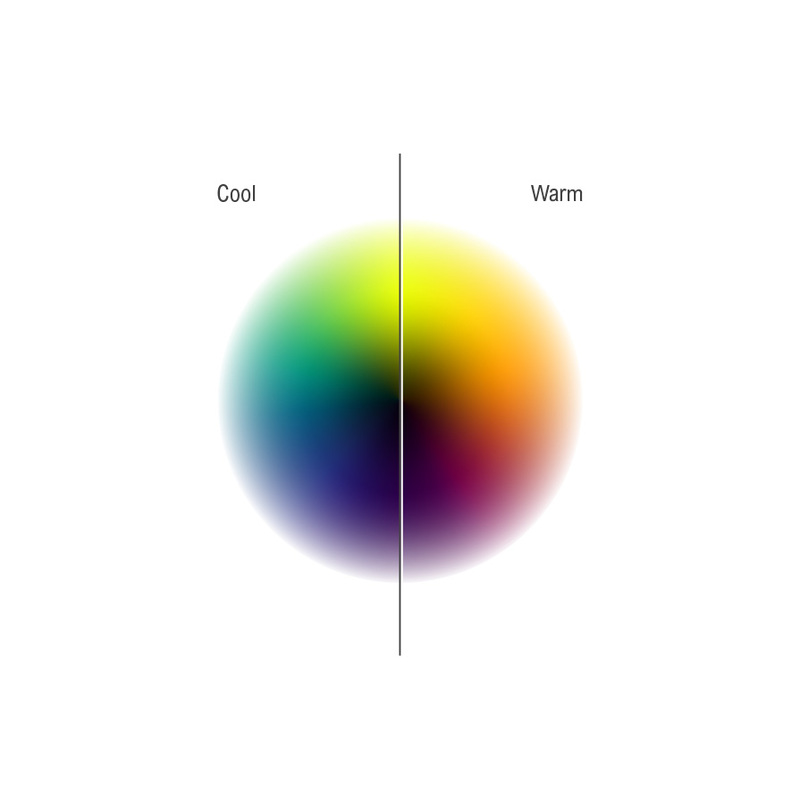 Sketch color should be determined by situation, meaning, are the darks you see warm or cool? Use 3 or 4 shapes to sketch in initially, keeping them in the light value range, then add darks before working up to lighter passages. 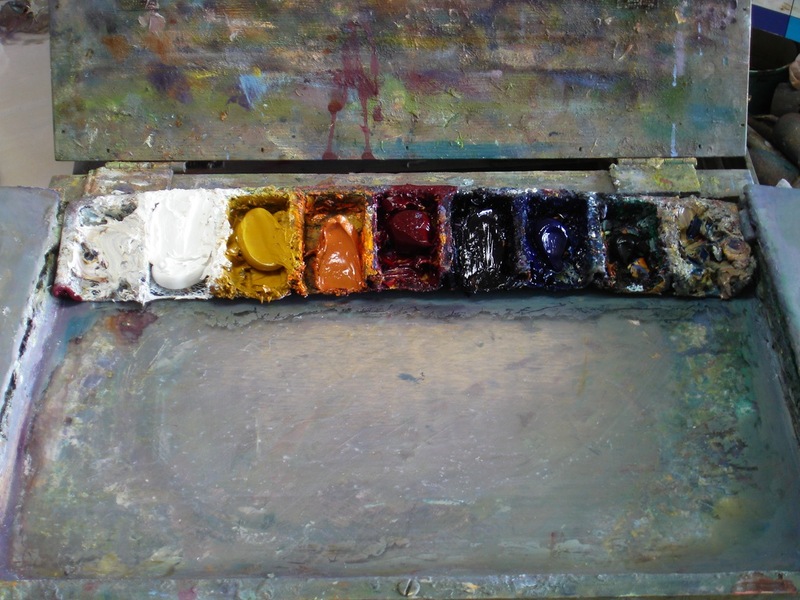 "This palette also includes my secondaries pre-mixed from a limited palette of yellow ochre, alizarin crimson, pthalo blue, and black. Also I want to show the paint in the divided tray I usually use. 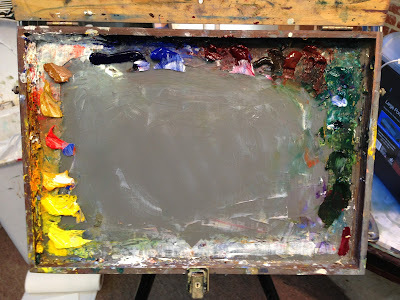 (So I may transfer the paint from one pochade to another, or back to my studio palette, or, it can be easily wrapped and stored in the refrigerator if I know I won't be painting for several days.)" If a certain painting requires an extra color use it regardless of your working palette. 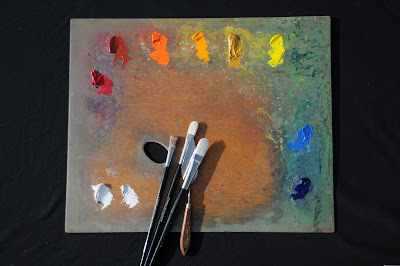 Paints with water-mincible oils for health reasons and because of how they handle with a knife. Likes to use Zinc White, for its transparency, its stiffness, and the fact that it takes longer to dry. 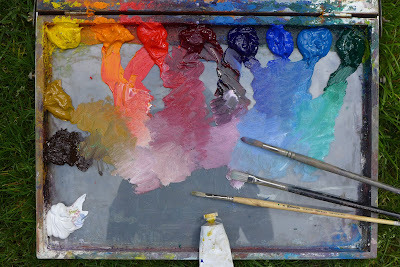 Arranges his cool hues on left side of palette, and warm hues along the top, with white in a corner. Paint on a white ground. The white permits keying the painting towards any hue. Try to start with high chroma and keep it high as possible. 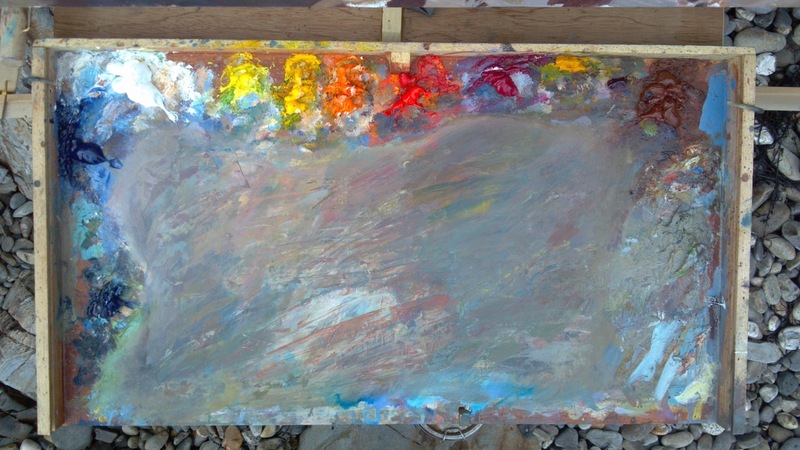 Stephen's palette and painting method is loosely based off of Emile Gruppe's palette, via his son, Robert C. Gruppe. It is also influenced by the theories and methods of Charles Hawthorne as well. Every now and then Steve goes back to painting using only Cadmium Red Deep, Cad Yellow Light, Ultramarine Blue to remind himself to be attentive to the color he sees. Thanks for the research, Thomas. I assume that "keep a gray pile going" means mixing palette scrapings together to make a gray from the colors used in the painting. If not, could you clarify? Yes, Bill. The gray pile is exactly that. The scrapings of your mixes. It can be very helpful in reducing the saturation, or graying out of a color. But remember there is white in it and that can affect the color you want to mix in a unwanted manner. WHOAAAAAA what a post! WOW! So much fun to take in the different palettes. Fantastic! You did a great job of researching. This is really fascinating! Jean LeGassick's palette looks really interesting. However, I can't figure out which color is which. 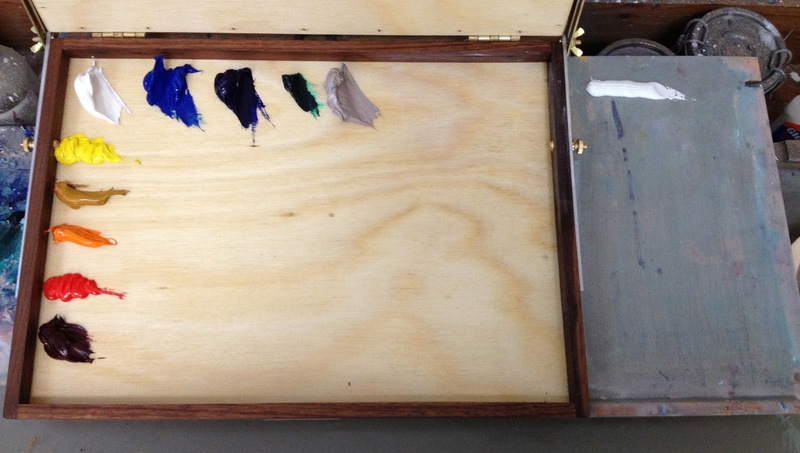 I recognize yellow ochre, alizarin crimson, maybe what I think is ivory black, and pthalo blue. 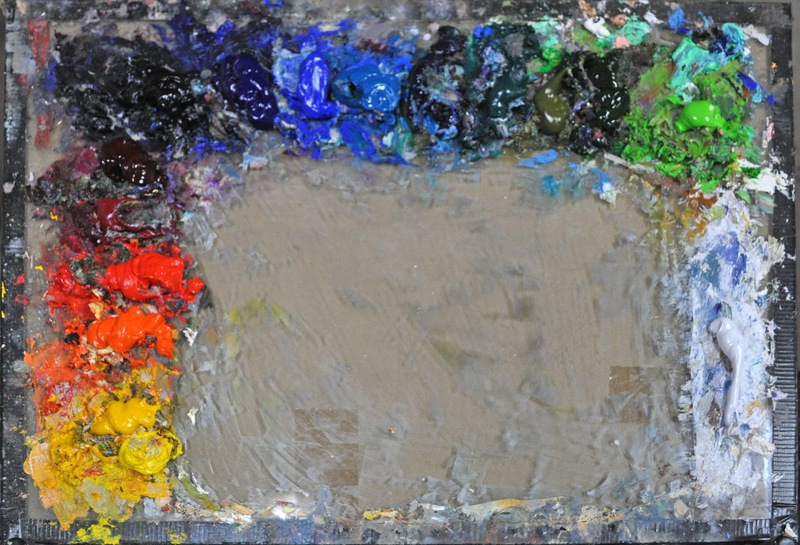 I think it's a mud pile on the right end of the palette, and some sort of light gray next to the white. What is that earthy orange? Sergio, the second palette listed matches the one pictured. it's the palette she has been using this winter. She considers it her "modified Zorn palette;"
The paint pile on the left is what she calls her "dirty white" (her words, not mine) and I believe it is her white scrapings from previous sessions. The pile on the far right is her mud pile and contains color from all her mixes. Wow Thomas, looks like a great post....lots of info you've gathered. Now I'll go back and dive in! Your site and beautiful work are very much appreciated. Thank you Jim. You are very kind. I had planned to have it ready for the convention but got behind. And decided to slow down so it wouldn't be rushed. 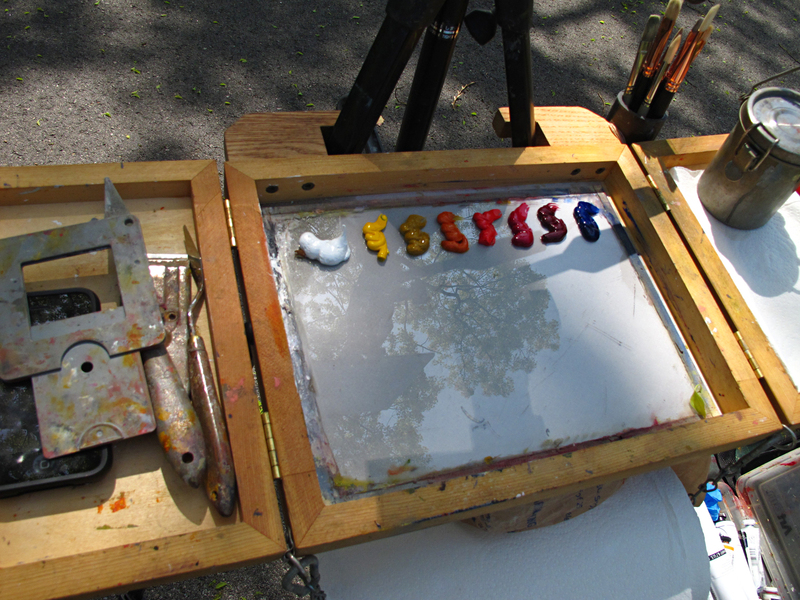 I want it to be of value and service to the plein air painter and not just swag to sell. Thanks Thomas for such a juicy post. 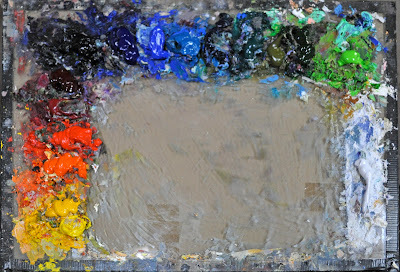 I am fascinated by the way each artist's palette of colors are piled up in unique ways and their mixing spaces on the palette. It's kind of like looking into each individual's mind. Also, I didn't know we had to sign up to watch your demo. Whaaaat? Fascinating behind-the-scene post Thomas, a full course meal and then some! Thanks for the prep work and beautiful presentation. You are welcome Lee. It was a pleasure to interview these painters and write the post. Very interesting comparisons and extra tips too! Thank you Thomas. I am feeling as though I should switch to oils. The way they dry in the wind is a big disadvantage. Seascapesaus, thanks, but I am not sure I understand your comment. Oils dry in the wind? Or are you talking about acrylics? I'm getting ready to go on another painting trip so I googled limited palettes and came across this post. Fantastic! My regular palette is not consistent enough to show my voice so I think downsizing will do more than just assist me on this trip. Most excellent resource and I look forward to your book. Thank you. Interesting to see how similar a lot of palettes are, but not surprised. I'm also curious as to why more people don't tube up a few gray values if they use them a lot. If I'm not mistaken did Emile Gruppe' palette not also include Phthalo blue as well. I'll ask a good friend of mine who paints with Emile's son on a regular basis in Provincetown and Gloucester. He'll know and tell us. Hi -- I just happened onto your workshop going on Sauvie Island today when I picked up some produce. Since I love to paint I quietly asked someone your name. You guessed it .. I came home and googled you. FANTASTIC blog!! 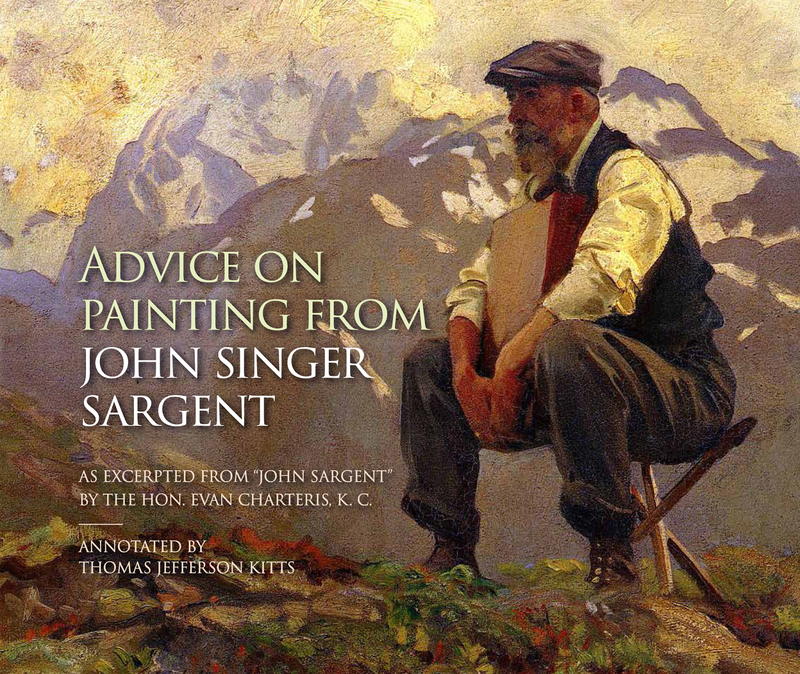 So much valuable information, plan to forward link to several painter friends. Can you settle a bet? Since you know Mr. Gruppe, can you advise as to how to pronounce his name?? Many thanks, look forward to more. Anonymous, glad you like the blog. and please share it with anyone you wish. But to clarify, I did not know Emile and don't know his son, Robert, whom I believe is still living and painting in the mid-Atlantic area. I only have a friend, Steve, also on the East Coast who paints with Robert on occasion. And I've only ever heard Gruppe pronounced as "Groop-pay". 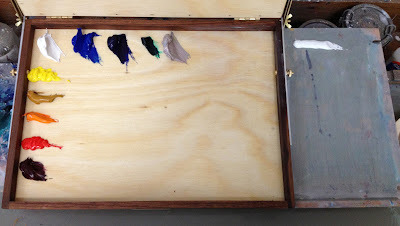 How do you like using Cerulean Hue or Manganese Blue Hue on you palette? Thank you for you kind comment, Chris B. Of course, there are time you want to mix a more neutral green but I've found that if I set a cool green against a warm green at the same value and saturation it generates a vibrating effect. Because the eye is attempting to distinguish between the two. This cool/warm juxtaposition is a large part of how French Impressionism works. But I am simplifying here for expediency. This would make a nice post so I'll do it after I get back from an event I am off to. Oh, and yes, real Manfanese Blue can be hard to find. But keep in mind that the real stuff is somewhat toxic and should be handled with care. It is also not as intense as the other colors you find on the palettes presented here. Both are resons why the real stuff has been marginalized. If you paint with it, great. But don't be careless about it. Thanks for doing this survey, The knowledge and tips are worth their weight in gold if one had to go these artists individual workshops. I'm a johnny come lately in the knowledge dept but the first I heard heard of gray piles was from a Ovanes Beberian blog. I've had lessons from my uncle and college and since studying on the internet from stapelton kearns and jill carver and all the other artists it helps to see how they work. We all need a mentor or mentors who know their craft and your survey is as good as it gets. What makes painting fun is discovery and growth. and struggle and frustration sometimes. Paul Stristik use to say when he was a beginning painter he could teach it but as he grew older and learned more he couldn't because it just go too complicated. The knowledge can be overwhelming if one digs. I can remember when a tube of paint was $1.60 cent in 1965. I like your paintings and your name. and your generousity for sharing. Painters might be the last benevolent dudes on the planet. I can't afford the 70 and 49 dollar tubes but I do like the limited palette. 3 oranges and 3 blues . Frederick Waugh said to make your black black. Anonymous, Thank you for your thoughtful post. The only thing I would add is that there is nothing wrong with painting with a limited palette. Look at what the classical painters of the past accomplished with just a few hues and I think you will agree. Perhaps this is a worthy subject on its own for a blog post. Good luck with your artistic development. And remember it is an enjoyable trip to be on. Progress is what counts, not success. Has anyone ever shown an artist's palette superimposed on a colour gamut diagram? 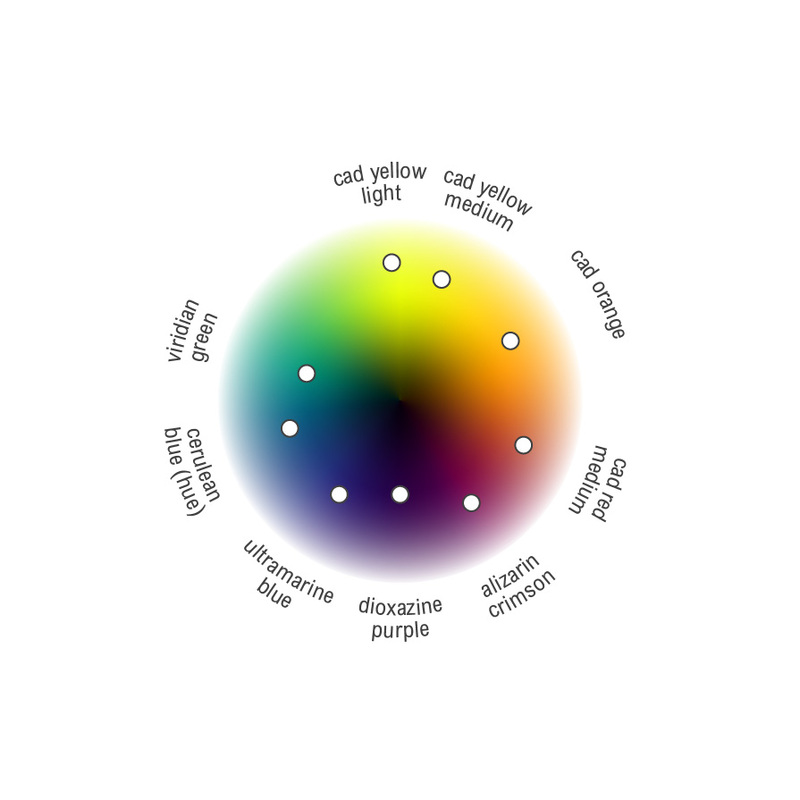 Apparently from certain starting hue sets, you cannot mix every colour you see, and this chart helps clarify that very point. Thomas, thanks for posting this good info on plein air palettes. It's so interesting to see what others are using/doing. Good stuff here! Thanks for posting this variety of palettes.